Since I live in the Evergreen State, it’s only fitting to call this my Evergreen quilt. 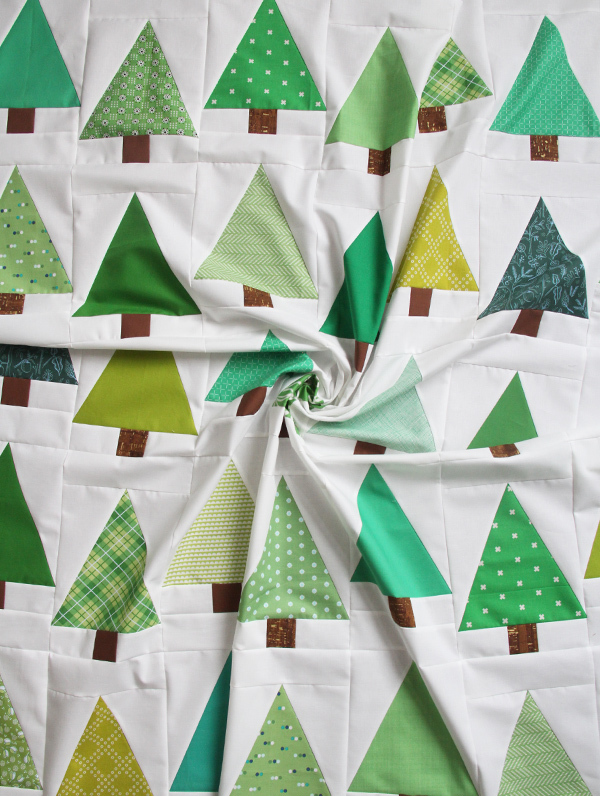 I made a handful of extra tree blocks when I was testing them for my Suburbs quilt, so I figured why not make a few more and put them to good use?! These are quick and addicting to make, and a good first project trying templates if you haven’t ever used them. I included some quick instructions for making this quilt below. It’s a fast sew, and a good use of the random leftover green fabrics I had stuffed into my stash. The finished quilt measures 49″ x 55″. 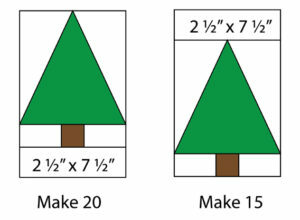 Make 35 tree blocks using this printable tree block pattern. Cut 35 strips 2 1/2″ x 7 1/2″. 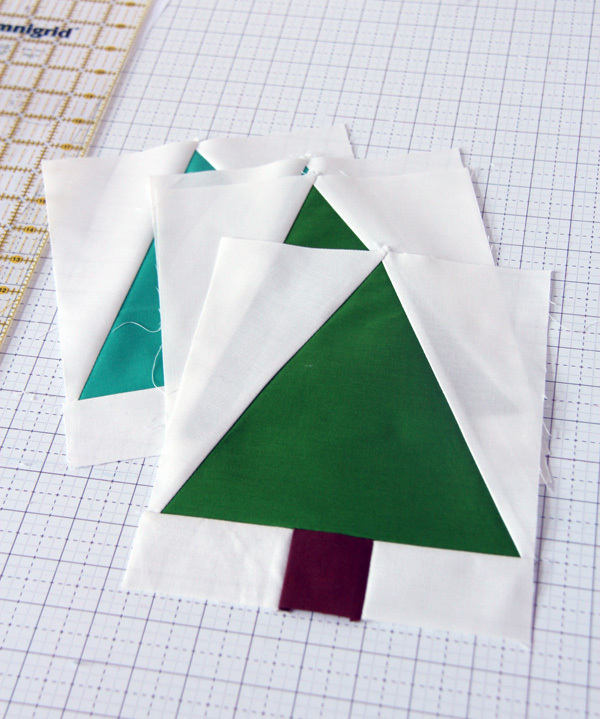 Sew a strip to the bottom of 20 tree blocks. 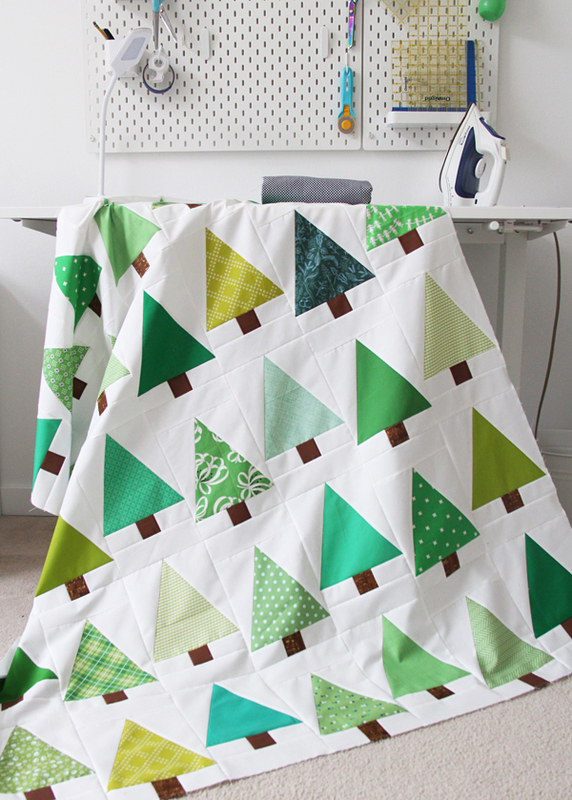 Sew a strip to the top of 15 tree blocks. 3. Layout the blocks into 5 rows of 7 blocks each, alternating between blocks with strips at the bottom or top. Sew blocks together to form rows, and sew the rows together to make the quilt top. I like to press my seams open, but you could also alternate pressing directions if you press to the side. 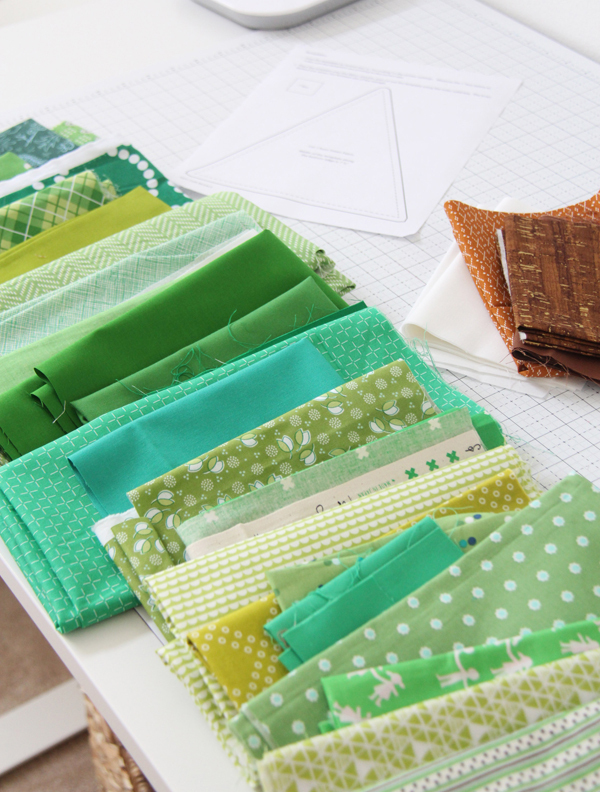 Don’t worry too much if you are sewing some of your points off a little or they aren’t perfect as you sew the quilt together…especially if you are a beginner! I did a super fast finish and quilted this with wavy lines on my Bernina with the walking foot. I use stitch 4, and set the width to 5.5 and the stitch length to 3. We are still hoping for some snow here in Seattle this winter…but for now it feels like Spring already. It’s 52 degrees and sunny, and Jane and I already walked through the park today after running errands. No complaints here! leftover greens. Thank you and a “Happy New Year” ……………. Thanks Libby and happy new year to you also! Love how this turned out, Allison! Looks like bright evergreens during the snowy season. Thanks for sharing. Such a simple design, but it turned out so cute! I’m going to use this to make my brother a TV quilt for his birthday! Thank you so much for the tutorial!!! Thank you for the tutorial! 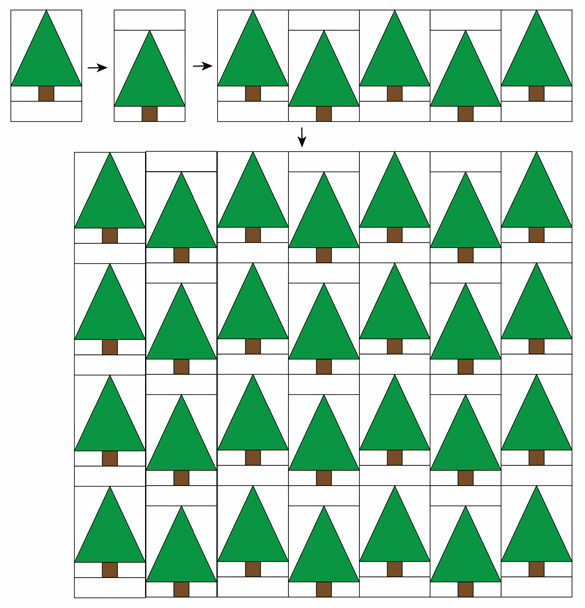 I’ve been wanting to make a tree quilt but haven’t gotten around to it. Similar to when I wanted to make a house quilt…and finally got around to it. Hugs! And thanks again! This is cute. Thanks for the tutorial. I picked up your suburbs pattern in December. 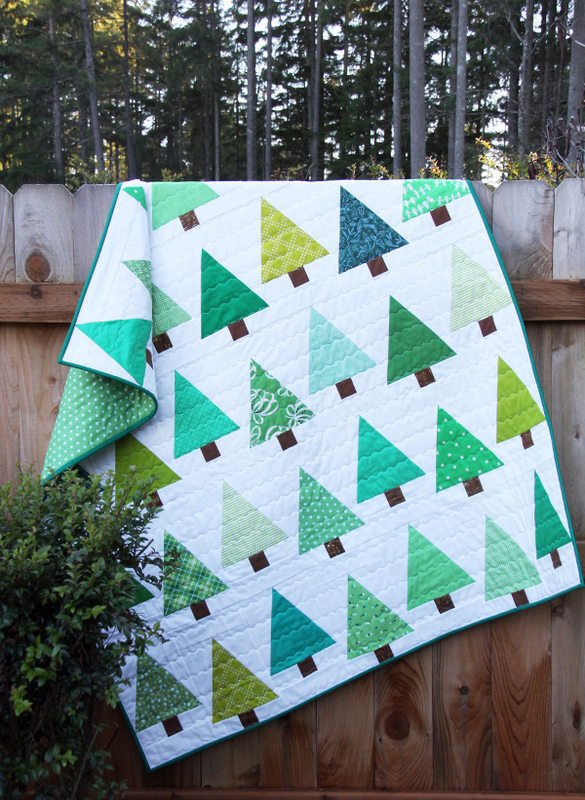 Love your Evergreen Quilt, Allison! Thank you for sharing the pattern with us! It’s a perfect winter quilt! Thanks for the shared tutorial! I love tree blocks! It looks really fun and whimsical! Thanks for the pattern. It’s a wonderful quilt. Happy New Year! You’re welcome and to you also! The the crisp clean look of this quilt. The quilting you used is my favorite go to. I’m thinking of making this my leader/ender project. Thank you. That comment was supposed to start with the word LOVE. Not sure what happened to it. But I do love it. Darling! You may be in the Evergreen State (and lucky you! )~~my family originates from there: Roslyn to Bridgeport to Wenatchee and points in between. But! 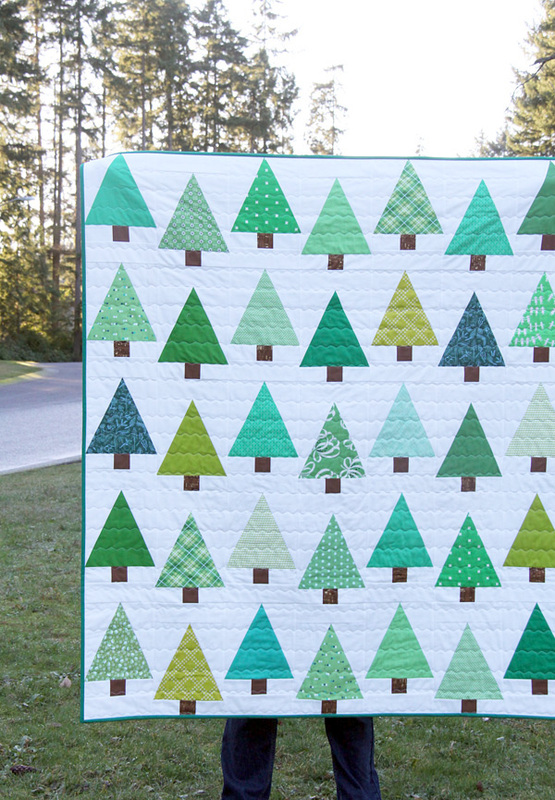 We have a LOT of evergreens in my home state of Colorado, and I just love this tree quilt! Thanks for sharing the pattern! And I like your “quick finish”, as well. MUCH better than that large meander (IMHO). Thanks Peggy! I love the trees in Colorado! Thank you very much for sharing and the pattern! I’m going to check my green situation now. What a perfect quilt for him! You can never go wrong with cozy minky for sure. What a beautiful quilt! Thank you for sharing the tutorial. I will definitely try it.